Home > PIC news > 3 trainees of Pacific-LEADS* visited PIC. 3 trainees of Pacific-LEADS* visited PIC. Pacific-LEADS* is a program emphasizing the importance of fostering upcoming generations to play key roles in the future of Pacific Island Countries. 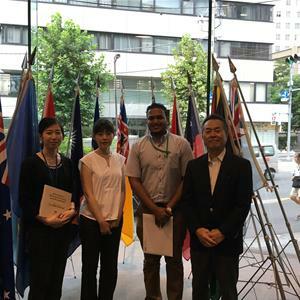 This program, mainly supported by JICA as secretariat, aims to provide study opportunities for government officials and other key personnel from Pacific Island Countries. These trainees are given opportunities to study in master’s courses and complete an internship in government ministries or local municipalities in Japan. Three of those trainees visited PIC and had an exchange of views as part of their training program on August 8, 15, and 22 respectively. After receiving an explanation about PIC’s activities, they had a question and answer session about PIC, followed by a presentation about his/her own country. This was a very productive opportunity for both parties. 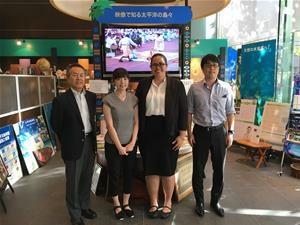 We expect they will become Japan supporters/experts who can contribute to improving the relationships between Japan and Pacific Island Countries, having developed a better understanding of PIC activities at this opportunity.